The donkeys were all good, all handsome, all strong and in good condition, all fast and all willing to prove it. They were the best we had found anywhere, and the most recherche. I do not know what recherche means, but that is what these donkeys were, anyhow. Some were of a soft mouse-colour, and the others were white, black and vari-coloured. Some were close shaven all over, except that a tuft like a paint-brush was left on the end of the tail. Others were so shaven in fanciful landscape garden patterns, as to mark their bodies with curving lines, left by the shears. They had all been newly barbered, and were exceedingly stylish. Several of the white ones were barred like zebras with rainbow stripes of blue and red and yellow paint. These were indescribably gorgeous. Dan and Jack selected from this lot because they brought back Italian reminiscences of the ‘old masters’. The saddles were the high, stuffy, frog-shaped things we had known in Ephesus and Smyrna. The donkey-boys were lively young Egyptian rascals who could follow a donkey and keep him in a canter half a day without tiring. We had plenty of spectators when we mounted, for the hotel was full of English people bound overland to India and officers getting ready for the African campaign against the Abyssinian King Theodorus. We were not a very large party, but as we charged through the streets of the great metropolis, we made noise for five hundred, and displayed activity and created excitement in proportion. Nobody can steer a donkey, and some collided with camels, dervishes, effendis, asses, beggars, and everything else that offered to the donkeys a reasonable chance for a collision. 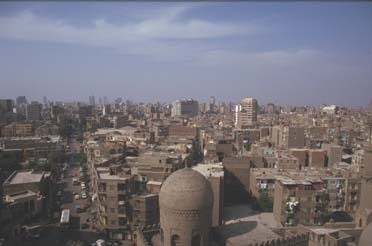 When we turned into the broad avenue that leads out of the city towards Old Cairo, there was plenty of room. The walls of stately date-palms that fenced the gardens and bordered the way threw their shadows down and made the air cool and bracing. We rose to the spirit of the time and the race became a wild rout, a stampede, a terrific panic. I wish to live to enjoy it again. . . . Arrived at Old Cairo, the camp-followers took up the donkeys and tumbled them bodily aboard a small boat with a lateen sail, and we followed and got under way. The deck was closely packed with donkeys and men; the two sailors had to climb over and under and through the wedged mass to work the sails, and the steersman had to crowd four or five donkeys out of the way when he wished to swing his tiller and put his helm hard-down. We had nothing to do; nothing to do but enjoy the trip; nothing to do but shove the donkeys off our corns and look at the charming scenery of the Nile. . . . At a distance of a few miles the Pyramids rising above the palms looked very clean-cut, very grand and imposing, and very soft and filmy as well. ... A laborious walk in the flaming sun brought us to the foot of the great Pyramid of Cheops. It was a fairy vision no longer. It was a corrugated, unsightly mountain of stone. Each of its monstrous sides was a wide stairway which rose upwards, step above step, narrowing as it went, till it tapered to a point far aloft in the air. Insect men and women . . . were creeping about its dizzy perches, and one little black swarm were waving postage stamps from the summit handkerchiefs will be understood .... On the one hand a mighty sea of yellow sand stretched away toward the end of the earth, solemn, silent, shorn of vegetation, its solitude uncheered by any forms of creature life; on the other, the Eden of Egypt was spread below us a broad green floor, cloven by the sinuous river, dotted with villages, its vast distances measured and marked by the diminishing stature of receding clusters of palms. It lay asleep in an enchanted atmosphere. There was no sound, no motion. Above the date-plumes in the middle distance, swelled a domed and pinnacled mass, glimmering through a tinted, exquisite mist; away toward the horizon a dozen shapely pyramids watched over ruined Memphis: and at our feet the bland, impassive Sphinx looked out over the picture from her throne in the sands as placidly and pensively as she had looked upon its life full fifty lagging centuries ago. Constance Sitwell creates a sense of endless time in her writing, recognizing times past while giving a very real sense of times present.